Where usually the piano would have stood naked and alone, now it was encroached upon by labyrinths of leads, plugs, pedals, knobs, faders and a synthesizer – like some sci-fi movie where a human metamorphoses into a robot. 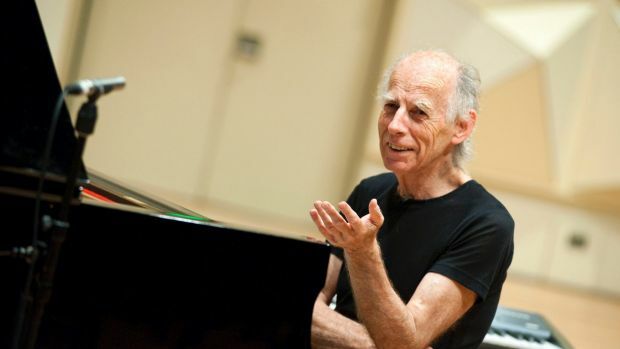 But then in an earlier life in the ’60s Mike Nock was among jazz’s first pianists to use electronics, and on rare occasions since he has revealed a singular command of the technology, possibilities and aesthetics, with no loss of the characteristics that define him. This was something different again, however, as he had penned an entirely new repertoire to incorporate the electronics into his trio with bassist Brett Hirst and drummer James Waples. To be fair, “something different” is Nock’s default setting: his last album placed this trio alongside a string trio, and his August appearance at Foundry 616 will feature his octet. Even the synthesizer wash opening Ambiguities carried no hint of corniness in Nock’s hands, and was embellished by opulent arco bass and Waples’ mallets. When this oneiric composition migrated from synth to piano the sophistication of the three-way interaction was striking. Alongside the beauty and brilliance of the new repertoire and the surprises coming from the knobs and dials, this was the night’s hallmark: no one finished the others’ musical sentences; rather they kept asking more questions. On Barney’s Call a jagged Latin groove was implied but never stated, and on the gorgeous, multi-faceted Electrochemiluminescence – the state in which overly excited chemical solutions emit light – the three-way invention was thrilling, with Waples shifting tonal colours across his drums and cymbals at a rarefied level. Nock’s distinctive playfulness was never far away, Ignore Alien Orders akin to the music wind-up jazz musicians would make were their clockwork mechanisms misbehaving. On Evocation a solo piano sequence showed his keen instinct for magnifying some notes by letting them hang in the air like a fragrance. This is now the most complete trio Nock has had since returning to Australia 32 years ago.